Sergio Aguero insists he wants to stay at Manchester City until his contract expires in 2020 - but says the club will make the decision. There has been recurring uncertainty over Aguero's future since Pep Guardiola took charge as manager in 2016, despite repeated assurances from the club he will not be leaving. In December reports emerged from the club claiming Guardiola was pleased with the striker and determined to keep him, having been impressed with his workrate and determination to adapt to his methods. But that did not prevent conflicting stories emerging suggesting the Argentinian, who became City's record goalscorer this season, was unhappy about not always starting and was inclined to push for an exit. Asked about this after scoring in City's 3-1 win over Watford on Tuesday, Aguero told reporters: "I have until 2020, I think. Asked further if he wanted to stay, the 29-year-old said: "For me, yes. Obviously my plan is not to change clubs. "The truth is I'm very happy here but, as always, as I said before, the club has the last word. "They're the only ones who decide, because obviously the club is the one who makes the decisions, they are the ones who say you have to go or have to stay, so I'll respect whatever they tell me." Aguero also said "everything's fine" when asked about his relationship with Guardiola. Aguero, who joined City in 2011, overtook Eric Brook's 78-year-old record to become City's leading goalscorer in November. 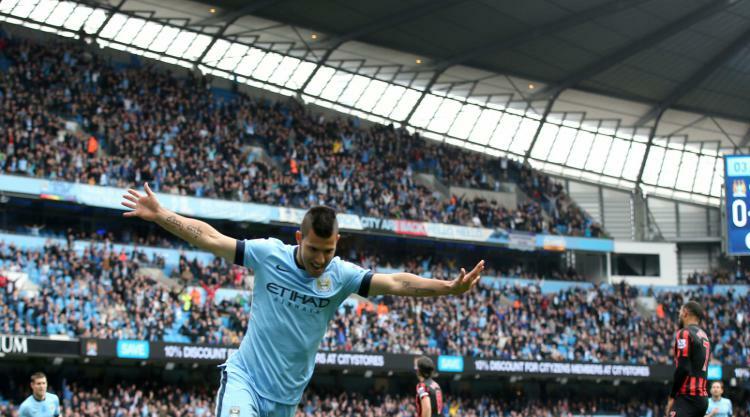 He has since scored seven more to take his City tally to 185. When asked about Aguero in December, Guardiola maintained his stance that the player would be allowed to stay as long as he wanted. He said: "He is a legend. He will decide absolutely everything about his life and his future. I'm delighted to have him here."